Soumastre, M., Rodr�guez-Gallego, L. & Piccini, C. Enterobacterial growth in coastal groundwater wells of Cabo Polonio (Uruguay): an experimental approach. Pan-American Journal of Aquatic Sciences, 10(3): 182-188. Download PDF file (416 Kb). Fuentes-Rein�s, J. M. & Elmoor-Loureiro, L. M. A. Annotated checklist and new records of Cladocera from the Ci�naga El Convento, Atl�ntico-Colombia. Pan-American Journal of Aquatic Sciences, 10(3): 189-202. Download PDF file (1,030 Kb). Guimar�es-Silva, A. A., Shinozaki-Mendes, R. A. & Andrade, H. A. Morphometric analysis of swimming crabs Callinectes danae (Crustacea, Portunidae) from the Santa Cruz Canal, Pernambuco (Brazil). 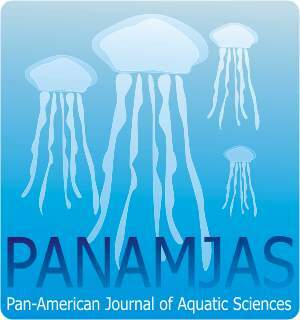 Pan-American Journal of Aquatic Sciences, 10(3): 203-211. Download PDF file (439 Kb). Farani, G. L., Nogueira, M. M., Johnsson, R. & Neves, E. The salt tolerance of the freshwater snail Melanoides tuberculata (Mollusca, Gastropoda), a bioinvader gastropod. Pan-American Journal of Aquatic Sciences, 10(3): 212-221. Download PDF file (358 Kb). Kassuga, A. D. & Masunari, S. Spatial distribution of juveniles of the mangrove crab Ucides cordatus (Linnaeus, 1763) (Crustacea, Brachyura, Ucididae) from Guaratuba Bay, southern Brazil. Pan-American Journal of Aquatic Sciences, 10(3): 222-229. Download PDF file (451 Kb). Branco, J. O., Manoel, F. C., Rodrigues Filho, J. L. & Barbieri, E. Correlation between abiotic variables and diversity of birds. Pan-American Journal of Aquatic Sciences, 10(3): 230-238. Download PDF file (399 Kb). Silva, W. A. da, Lage-Pinto, F. & Bernini, E. Leaf damage in three mangrove forests in Northeast Brazil. Pan-American Journal of Aquatic Sciences, 10(3): 239-248. Download PDF file (316 Kb). Bakhmet, I., Abessa, D. M. S., Buruaem, L. M. & Bonnail, E. A Non-Invasive Technique for Recording the Cardiac Activity of the Tropical-Subtropical Mangrove Oyster Crassostrea brasiliana. Pan-American Journal of Aquatic Sciences, 10(3): 249-253. Download PDF file (409 Kb). Rodriguez-Machado, S. & Rodriguez-Cabrera, T. M. First record of native amphibian predation by the invasive alien African catfish Clarias gariepinus (Siluriformes, Clariidae) in Cuba. Pan-American Journal of Aquatic Sciences, 10(3): 254-258. Download PDF file (664 Kb).